With Germany having gone through a surge of seemingly daily killings in the past two weeks when 15 people have died, including four assailants, leaving dozens injured since July 18, the result of two terror attacks and a third killing carried out by men who entered the country as refugees, no one has seen their reputation impacted as much as Angela Merkel. And yet, despite admitting several weeks ago that “terrorists were smuggled in Europe’s refugee flow“, Merkel has been unrelenting on her immigration policy. 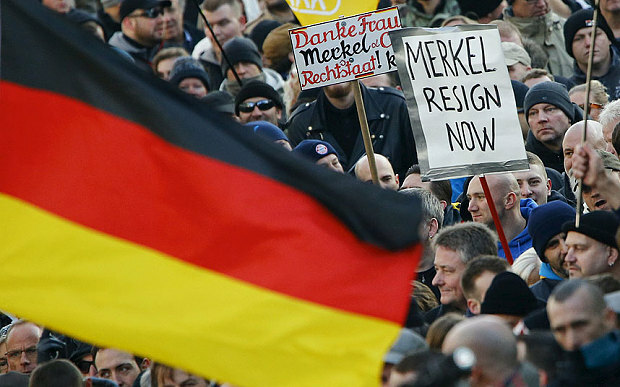 The problem for Merkel is that increasingly less of her countrymen share her sentiment. A recent poll found that two-thirds of Germans oppose a fourth term for Merkel. Only 36% of respondents said they wanted Merkel and her CDU to lead the government after federal elections in 2017. It got even much worse for Merkel yesterday when Bavaria’s premier, a key coalition ally for Merkel’s CDU, whose state bore the brunt of recent attacks in Germany, took aim at Chancellor Angela Merkel’s open-door refugee policy on Saturday by rejecting her “we can do this” mantra, withdrawing his support over this key aspect of Merkel’s domestic policy. The comments from Seehofer, who said following the latest attacks that “all our predictions have been proven right”, came after Merkel on Thursday defiantly repeated “we can do this” and vowed not to bend her refugee policy. The stark disasgeement by Seehofer, whose Christian Social Union is the Bavarian sister party of Merkel’s conservatives, will exacerbate the chancellor’s difficulty in standing by a policy that her critics have blamed for the attacks and which risks undermining her popularity before federal elections next year. Five attacks in Germany since July 18 have left 15 people dead, including four assailants, and dozens injured. Two of the attackers had links to Islamist militancy, officials say. Germany is wrestling with how to respond. Jens Spahn, deputy finance minister and a senior member of Merkel’s conservatives, said that integrating the refugees was a Herculean task but the government needed to put more pressure on those new arrivals unwilling to make an effort to fit in. “A ban on the full body veil – that is the niqab and the burka – is overdue,” he told daily Die Welt. “My impression is that we all underestimated a year ago what would come upon us with this big refugee and migration movement.” Well, maybe not all. But worst of all, the anger has now openly spilled over from the top political ranks and the front pages of local newspapers to the streets, as more than 5,000 people protested in Berlin and thousands more throughout Germany over Merkel’s ‘open-door’ policy that many have blamed for the four brutal terrorist attacks that left over a dozen dead. Indeed, the local population appears to have finally had enough, after an axe rampage, a shooting spree, a knife attack and a suicide bombing in the span of a week stunned Germany. ‘Merkel must go’ has been trending on social media, with people posting powerful pictures including one claiming that she has blood on her hands after recent attacks. The picture shows her splattered with blood, while another depicts her wearing a Burka, the Daily Mail reports. A new survey found that 83 per cent of Germans see immigration as their nation’s biggest challenge – twice as many as a year ago. And on Saturday, thousands of protesters calling for her to step down also met counter-protests from the anti-right-wing movement, in Germany – which is still in a state of high alert. According to the Mail, more than 5,000 took to the streets in Berlin with thousands more protesting throughout Germany, demanding an end to the “open door” policy and seeking Merkel’s resignation. The Chancellor faced a fresh wave of fury after it emerged that two recent terror attacks and a third killing were carried out by men who entered the country as refugees, which further fuelled the right-wing movement. Despite the massive waves of criticism from right-wingers (pictured, Berlin, today, wearing a shirt that says The German Reich lives within us), Merkel defended her policy this week. There was a heavy police presence (pictured) in Washington Square in Berlin as activists protested today. Any more attacks by refugees, and with no change in immigration policy they are virtually assured, will result in even more political bickering, and even more popular protests until finally Merkel herself may be forced to admit defeat, which would be the most devastating blow for Europe yet. It would be ironic if the woman who has almost single-handedly kept Europe together over the past 6 years, surviving fears of Grexit, banking crises, a Brexit and so much more, is ultimately undone by a mistake she herself has made. The last question: should the German chancellor be swept away, just who will have the stamina and the strength to keep a “united” Europe – Merkel’s political legacy – together?